Published: June 11, 2013 at 09:13 p.m. Updated: June 13, 2013 at 12:59 p.m.
LOS ANGELES -- Electronic Arts Sports general manager of football Cam Weber played quarterback for Simon Frasier University in Vancouver. So it should come as no surprise that he takes a ton of pride in the improved line play in the next generation of the iconic Madden video game franchise, "Madden NFL 25." "We wanted to take line play to the next level," Weber said from the Electronic Entertainment Expo (E3), the annual video game conference and trade show held in downtown Los Angeles this week. For those avid gamers who have long grown frustrated of linemen who missed blocks or fullbacks who ran past linebackers without even a cursory glimpse, this is good news. The goal, according to Weber, is to raise the intelligence of the linemen to recognize assignments. Of course, the old quarterback does admit he might have given the offensive linemen the benefit of the doubt. Not only does Weber bring some on-the-field perspective to the product, he's surrounded himself with likeminded people. Former Washington Redskins offensive lineman Clint Oldenburg started last year as an intern, but is now an associate designer with EA. Oldenburg helps with the ratings and he spent countless hours in film study to make the game as authentic as possible. But would that be fair to Peyton Manning, who would no doubt be the slowest quarterback in the NFL? "You'd be surprised at how athletic he is," Oldenburg said. "I had to adjust his agility after he hurdled a guy in San Diego." "It's on tape," Oldenburg said. Speaking of quarterbacks, the prevalence of the read-option is also a big part of the game. Just as defensive coordinators must do, gamers must find a way to stop the read-option. But here's some advice to defensive coordinators out there: Reach out to your local gamers. We've had to deal with this problem for months and some of us have become very good at stopping it. All right, you've read this far so now you want to know; how does it play? The version at E3 is a scaled-down model of what we're going to see this summer. Barry Sanders is on the cover and Adrian Peterson will be on the XBOX One version. We only got a chance to use the Vikings against the Redskins, but I still got enough of a taste. One thing that always seemed to kill me was the guard who would miss a block on the lead draw or toss plays and get my running back blown up. No problem so far. I even reversed the run from the right to the left side to see if I could trip it up. Nope, all good. Take a look at some of the latest players to grace the cover of the Madden video game. The graphics also continue to get better. As I watched Adrian Peterson run, you could almost see the adamantium. Seriously. I mean, video games took a huge leap years ago, but you see the subtle changes from year to year. First it was ankle splats, and then the cuts on a player's arm. The thing that stood out to me and my producer, Alex Gelhar, were RGIII's dreadlocks. 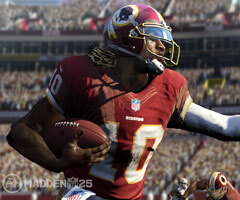 Normally, dreads on the video game look like a jumbled clump of hair. But you could see nearly each individual strand. I'm not sure if it's something you'll be able to see in the game, or if it was just spruced up for the event, but it was rather striking. As a guy who will no doubt be in line when the "Madden NFL 25" comes available, I feel confident these subtle changes are going to be worth it. 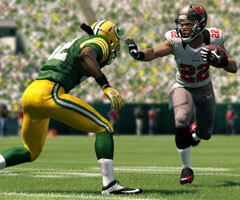 Overall, I give the new Madden game my highest rating. You can follow Adam Rank on Twitter @adamrank. And check him out on the latest "Dave Dameshek Football Program".